迪士尼 Mermaid Princesses. . HD Wallpaper and background images in the 迪士尼经典系列 club tagged: disney princesses mermaids colorful classic ariel the little mermaid. I think it's really cute. I love mermaids, so why not? finally Ariel gets some attention! 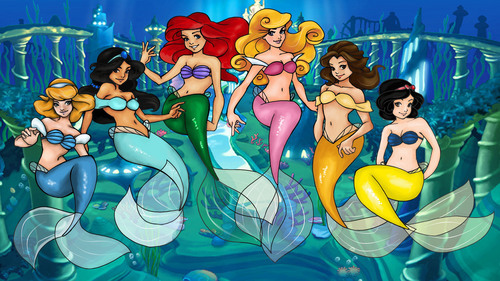 i love ariel i wish i was part of her world!!!!!!!!!!!! That is sooooooooooooooooooo cute.... but where is mulan??? or is she not considered a princess?? I was wondering if there was anyway I could buy this as a large poster/print out? Thats cute! Where is Tiana and Rapunzel? Purpledolphin, don't be stupid, you this was made before they came out.